Do you love the taste of fresh tomatoes, which are grown in the garden? Do you also like tomato salads, sauces and soups? And have you already tried tomato fresh juice? The season of tomatoes is coming! Let’s try to consume their crop in a different way than you’re used to. Tomato fresh juice is tasty, refreshing and full of lykopen. It’s a natural antioxidant, which protects you against the whole range of serious illnesses. Lykopen is a natural coloring that makes tomatoes red. At the same time it’s antioxidant, which fights free radicals within your body. And how it helps your organism? Cardiovascular illnesses and cancer are unfortunately the most common causes of death. Therefore British scientists have developed "magic" tomato pill with a very high content of lykopen. This will very soon be a part of the prevention and medical treatment of above-mentioned illnesses. In just 100 ml of fresh tomato juice you can find approx. 10 mg of lykopen, which is very much in comparison with other vegetables. Very good sources of this wholesome substance are also boiled tomatoes in a form of soup and sauce. “OK, I’m in, but where to find appropriate tomatoes?” For the first sight it seems as a silly question but it’s not. If you don’t grow your own tomatoes, you go and buy them mainly in supermarkets, where local fresh produce is very rare. Usually you find tomatoes from southern countries like Spain. They look very nice, but what about taste? To be honest, we wouldn’t make fresh juices out of these! Why is it so? Such tomatoes are special varieties with a very high yield, which are harvested before they ripen. They’re not grown in a soil. You can find them in a big greenhouses growing out of liquid fertilizers. You know the outcome pretty well – big and suspiciously red tomatoes without any taste. Try to buy local produce from farmers and you’ll see the difference right away! Prepare your own tomato drink! To get the best taste out of your refreshing drink, we recommend to juice cherry tomatoes. The juice is not that thick, which is better for such a beverage. Do you already have local tomatoes? Great! Tomato juice is the most important ingredient of a very well known cocktail called “Bloody Mary”, which is usually served on ice with a stick of celery. Try its healthier version! 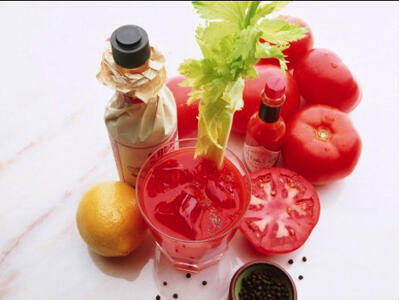 You can also try fresh tomato juice without any other ingredients and just enjoy its pure taste.